The nature of ballet and dancing places a lot of stress and pressure on the feet and legs which makes them prone to injury. Some of the most common ballet and dance injuries can be managed easily with the right diagnosis and treatment plan. Before beginning on pointe in ballet it is important to have your feet medically cleared by a qualified professional to ensure that your feet are physically prepared for the demands of pointe work. Testing the range of motion of the joints and strength and flexibility of the muscles of the feet and legs is part of a pointe assessment. At Sole Podiatry we can conduct a comprehensive pointe assessment and prescribe appropriate exercises to prepare your feet for pointe. 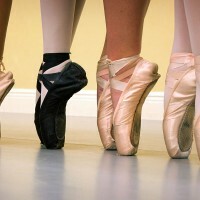 What is a Pre Pointe assessment? A pre pointe assessment is conducted by an experienced health professional to assess a students readiness to begin ballet ‘en pointe’. At the end of the assessment, each student is given a personalised take home strength and conditioning program to build up their strength and control to further prepare their bodies for the demands of pointe work. This may include functional exercises, theraband work and stretching. When should a Pre Pointe Assessment be conducted? We recommend a pre-pointe assessment to be completed by all girls wishing to commence pointe work. Ideally the pre-pointe assessment would take place 3-6 months before they wish to begin their pointe classes, so that we have adequate time to work on any areas requiring further strength and conditioning. When am I ready to start Pointe? Ballet teachers usually indicate when a student is ready to begin pointe work, after which a pre-pointe assessment can take place to check all the other areas and ensure the student’s body is as best prepared as possible for the demands of pointe work. What are the risks with starting Point too early? Dancers who begin pointe too early or without proper conditioning work (ie specific exercises) are at risk of damaging the development of the growth plates in their feet or serious injury. When dancing on pointe, the force of body weight is 12 times higher through the foot and ankle. This extra force can leave the foot and ankle vulnerable to injury. Joint hypermobility (flexibility) is prominent in dancers, which causes laxity in the joints, ligaments and tendons. It is important for hypermobile dancers to undergo specific strengthening exercises to decrease their risk of injury. Dancers with a rigid (stiff) lower limb can also be placed at an increased risk for injury as they don’t have the appropriate amount of range of movement which allows them to safely dance on pointe. What is strength and conditioning for ballet? What are common dance injuries? Because of the physical demands of ballet, dancers are 80% more at risk of injury than the general population. At Sole Podiatry we have vast experience in dealing with these and many other dance related injuries to the foot and ankle. Early intervention and diagnosis is the key to correct rehabilitation and recovery.